You know, I hate getting to Friday and not having a Finished Object to post in Tami's blog hop. You can perhaps imagine how it felt to have not one, but two FOs today that I haven't posted. Time to rectify that before I go to bed. The first is a gift, a cute pair of little crochet mitts which I'll photograph for another day. The other....well..... you can see for yourself why I didn't rush to post them earlier. 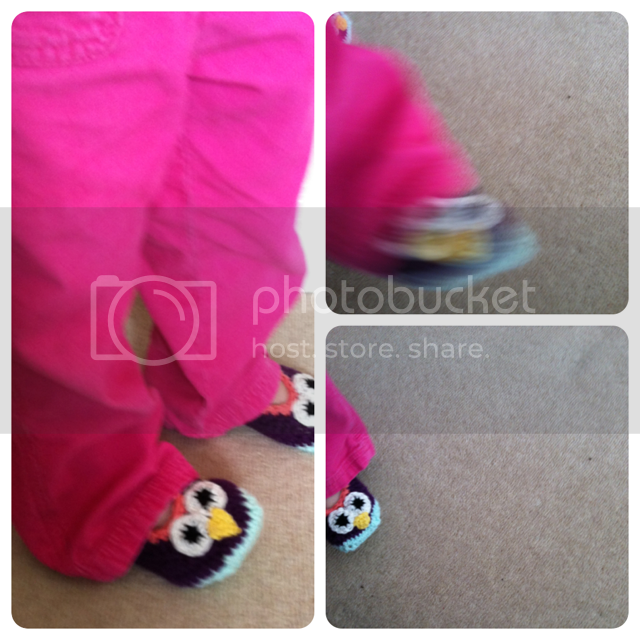 PATTERN: Plain Janes II with additions to make "owly slippers"
HOOK: 4.5mm - I think! It has been noted here many times before, but Little Miss actually can't keep still (or in shot) long enough for a decent photo of her/an item of her clothing to be taken, which makes these the three best pictures I took of her new slippers. So that's it for my projects but I'd like to say thanks for all the comments and stories that were shared about career changes after my post on Tuesday. And also a 'hello & welcome' to new followers - the new Twitter seems to have unearthed quite a lot of followers (here and there) and I've found some other lovely Tweeps and crafty blogs too - including this one and this useful one with a new knitting stitch and demo video each week. If you're on Twitter, please come and say hello. Before I sign off I'll take a wild guess that if you read my blog you like blogs and knitting, and if you like blogs and knitting, I'm sure you must already be reading the Yarn Harlot. Just in case you're not - presumably because you've only just landed on the planet are searching blogs alphabetically - I really would urge you to check it out. I'm constantly in stitches (pardon the pun) reading Steph Pearl McPhee's knitty antics and ramblings, and this week there have been some classics... oh, and I'm so glad I already have an iPad, or I would certainly NEED one this Christmas! Hmmm, on second thoughts, maybe you should avoid it if you don't have one and already asked Santa for something else...? Anyway, it's past my snuggle-in-bed-with-Kindle time so I'll bid you farewell for now. PS I'm not sure what's happening with the formatting tonight - blame Blogger not lack of attention. The slippers are adorable! I really like the new look of your blog. Even though they are blurry they are really very cute! I also had trouble with moving kids today... sometimes photos just arent meant to be in focus! Such cute slippers, and none the worse for being taken in action! I thought about trying the Rico Creative Cotton but I'm glad now that I decided upon something else. Thanks for the tip. Happy Christmas. Cute cute slippers. I'm thinking of scheduling myself to make some items for myself next year. I keep seeing such cute things as I do my walking through FOF. Thanks for your visit and comment, both are appreciated. Hope to see you soon and often. cutest slippers!!! I am in love.